We had a night fishing charter for Red Drum yesterday in the Chesapeake Bay. We left Vinings Landing Marina at 6:30 pm and returned at about 11 pm. Located in Norfolk, Virginia this makes it a quick run to our Red Drum fishing grounds. 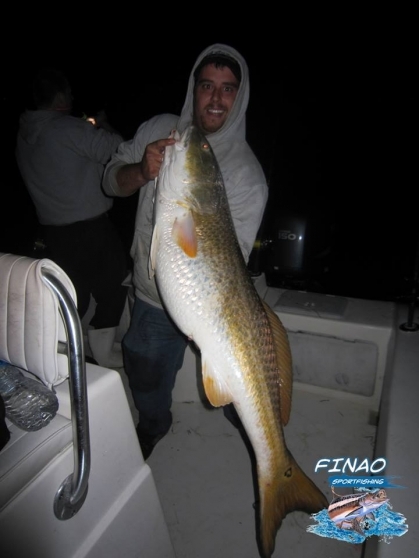 Red Drum feed more in the night making this a prime fishing trip for night time. With a night fishing charter we recommend a 5 hour trip. Red Drum are a large and powerful fighting fish! The average size of Drum we catch is about 40-45 pounds. Virginia is possibly the best location on the East Coast to catch big Drum. In Virginia you are awarded a trophy if you catch a Drum of 46 inches or greater. Red Drum migrate into the Chesapeake Bay in late April and stay in the Bay throughout the Summer. Prime season for night fishing charter for Red Drum is mid May – June. Red Drum move around in large schools feeding off the bottom for Blue Crabs, Small fish, and Clams. Red Drum move around and are more active during the night making this a perfect night fishing charter. While Red Drum fishing when you get into large schools it is not uncommon to hook multiple Drum at the same time. Using the correct gear for Drum is important. We use Shimano Rods, Daiwa Reels, Gamakatsu hooks, Power Pro Braided Line, and Ande Leader. All rods and gear are included on our night fishing charters. On our Red Drum trip we arrived to our first location at around 7 pm. On our first cast we caught our first Red Drum! As the sun began to set the fishing became better. We ended our night with about 12 big Red Drum and 8 of them being greater than 46 inches! Over all it was a great fishing trip and constant action. Be sure not to miss out on the amazing night fishing Virginia has to offer!